Guillaume Azoulay, "Lever De Soleil" Limited Edition Serigraph with Hand Laid Silver Leaf, Numbered 50/50 and Hand Signed with Certificate of Authenticity. $3,500.00 $900.00 Only 1 Left! 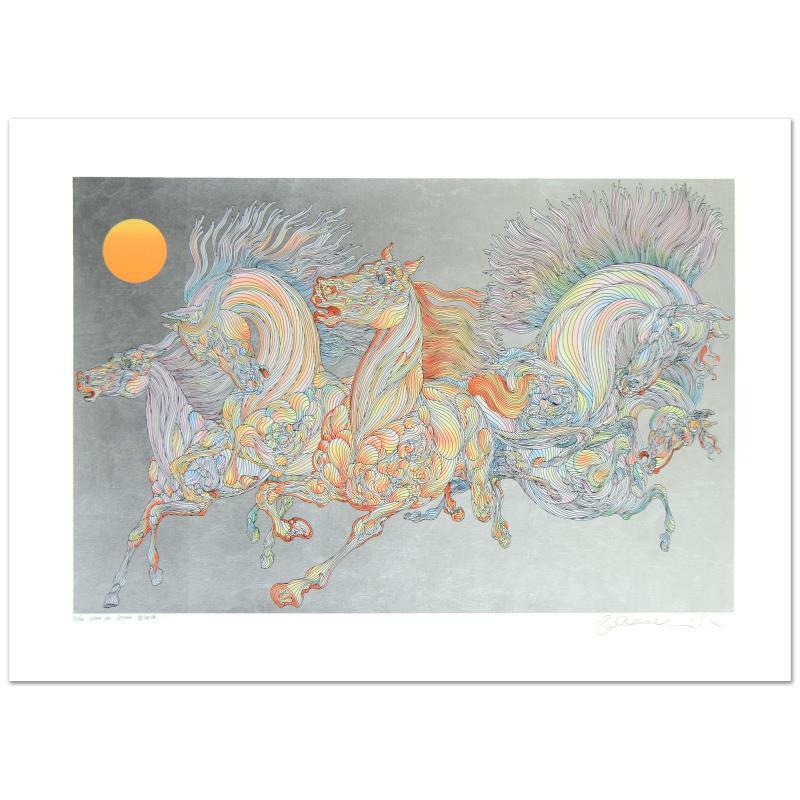 "Lever De Soleil" is a limited edition serigraph on paper with hand laid silver leaf by Guillaume Azoulay, numbered 50 out of 50 and hand signed by the artist. Includes Certificate of Authenticity! Measures approx. 38" x 27.5" (border)., 32" x 21" (image). Guillaume Azoulay, a self-taught artist, was born in Casablanca, Morocco in 1949. His parents settled in Paris when Azoulay was ten and by the age of thirteen, he was sketching and selling his drawings on the streets and planning his career as an artist. As Azoulay met people from various parts of the world, his interest in traveling grew, and when he was fourteen he left home and hitchhiked across Europe and the Middle East. His desire to see and be part of the life, history and beauty of the world took him from Copenhagen to Rome, from Lisbon to Jerusalem. Indeed, Azoulay made the world his university. The brilliance of Azoulay’s art centers on his ability to convey a purity of individual lines intricately joined to create an overpowering illusion of fluid motion and life. Line is the key element of design in Azoulay’s artwork. Often, Azoulay will create an entire artwork without ever lifting pen from paper, using a single, unbroken line. It is through his lines that Azoulay creates balance, harmony, contrast, depth and movement in each one of his compositions. Guillaume Azoulay is self-taught, and his art, far outside any boundaries that contain more pedestrian styles and techniques, transcends the faddish and the pretentious. His style is so unique that it is instantly recognized and unmistakably his. Horses, dancers and figures are treated as graphic landscapes. Hooves, heads, manes and limbs are so many hills and valleys. Shaded glades are evoked by the manipulation of parallel lines theatrically meandering, running close at times then separating to mimic the topography of some lost geography. His colors are the rainbow-like refraction of light after a downpour as they pick up the threads of his linear tale and weave them into a solid cloth. Guillaume Azoulay, "Tryst" Framed Limited Edition Etching, Numbered and Hand Signed with Certificate of Authenticity. Guillaume Azoulay, "Etude AZH" Framed Original Drawing, Hand Signed with Letter of Authenticity. Guillaume Azoulay, "El Dorado" Limited Edition Giclee on Canvas with Hand Laid Gold Leaf, Numbered and Hand Signed with Certificate of Authenticity. Guillaume Azoulay, "Tryst" Limited Edition Hand-Watercolored Etching, Numbered 20/20 and Hand Signed with Certificate of Authenticity. Guillaume Azoulay, "Tryst" Limited Edition Hand-Watercolored Etching with Hand Laid Gold Leaf, Numbered and Hand Signed with Certificate of Authenticity. Guillaume Azoulay, "Tryst" Limited Edition Hand-Watercolored Etching with Hand Laid Gold Leaf, Numbered 1/20 and Hand Signed with Certificate of Authenticity. Guillaume Azoulay, "Tryst" Limited Edition Hand-Watercolored Etching with Hand Laid Gold Leaf, Numbered 20/20 and Hand Signed with Certificate of Authenticity. Guillaume Azoulay, "Lever De Soleil" Limited Edition Serigraph with Hand Laid Gold Leaf, Numbered 1/50 and Hand Signed with Certificate of Authenticity. Guillaume Azoulay, "Lever De Soleil" Limited Edition Serigraph with Hand Laid Gold Leaf, Numbered 50/50 and Hand Signed with Certificate of Authenticity. Guillaume Azoulay, "Lever De Soleil" Limited Edition Serigraph with Hand Laid Gold Leaf, Numbered and Hand Signed with Certificate of Authenticity.